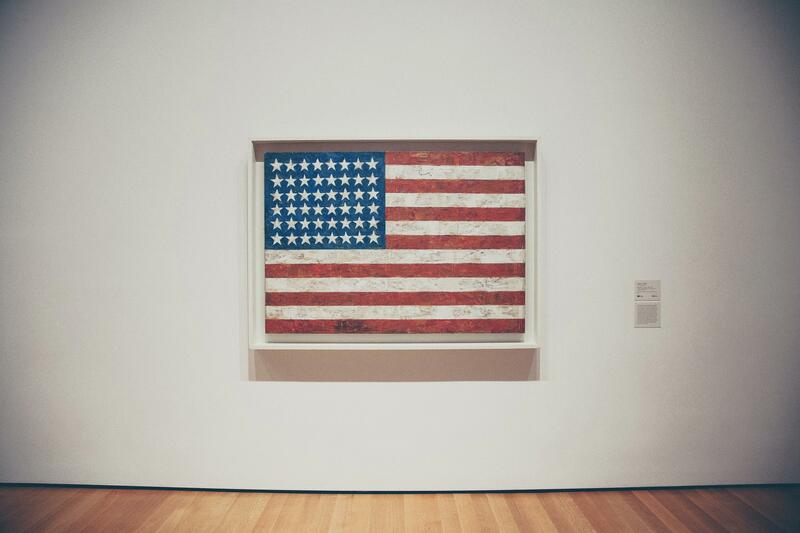 A few weeks ago, we listed the 6 UAE Recruitment Agencies that you should follow on Twitter and because we got such a great response, we thought it would only be right to continue our tour of the globe and shine a spotlight on the USA recruitment agencies this time around! So get your phones and laptops at the ready. You’re about to go on quite the following spree! 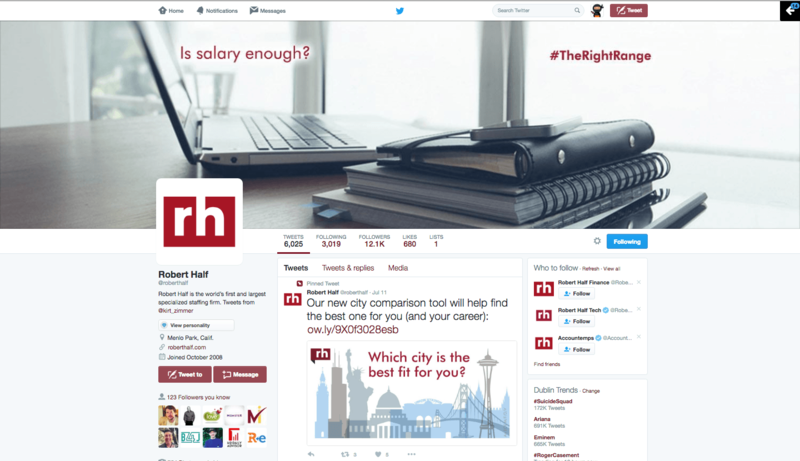 The US Twitter account for Robert Half is a treasure-trove of useful content aimed at making the lives of recruiters and job seekers easier. Sharing articles from their hugely popular blog, topics range from industry trends to office culture to hiring advice, so there really is something for every recruiter to take away on a daily basis. 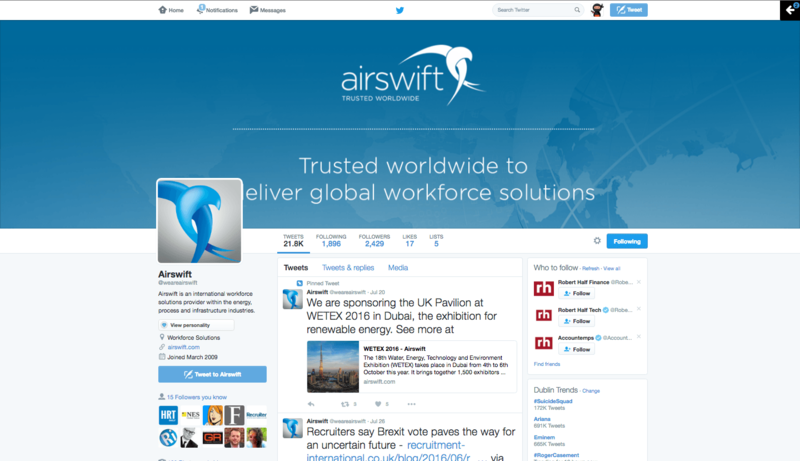 Recently named one of the largest staffing firms in the USA, Airswift’s Twitter account mainly focuses on news within the recruitment space, generally centred around the oil and gas sector. The workforce solutions provider also shares lots of photos of their teams around the world as well as conferences that they are attending using the hashtag #WeAreAirswift. 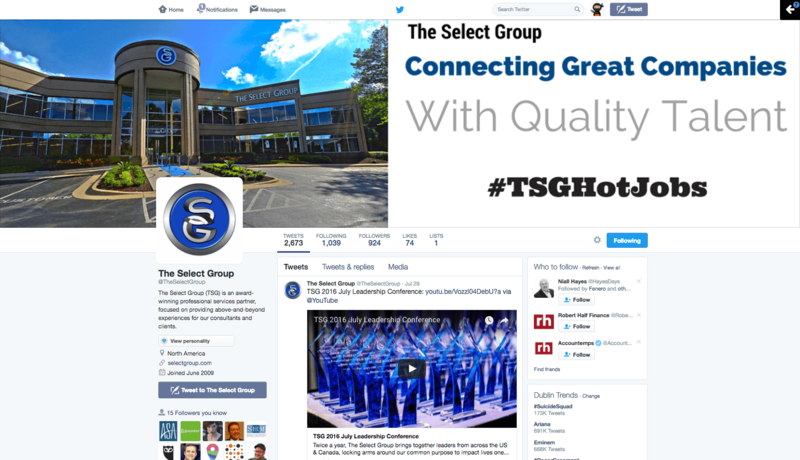 It’s clear to see that The Select Group has adopted the personal approach when it comes to Twitter. As well as sharing lots of useful recruitment articles from around the web, they also respond to and retweet a high volume of their mentions from followers, proving that engagement really is key when it comes to Twitter. No doubt that this is a Twitter account that will continue to go from strength to strength in the future. 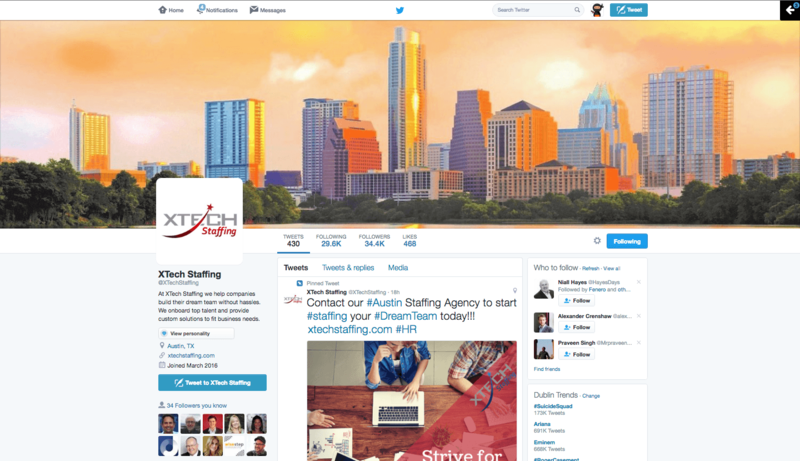 Boasting an impressive 34,000 followers, the XTech Staffing Twitter account is brimming with beautiful eye-catching graphics ranging from ‘did you know’ facts to motivational quotes and job openings alike. They get the balance just right between offering followers really valuable information and promoting their services. This one really is an account that every recruiter not to mention every recruitment agency could learn from. 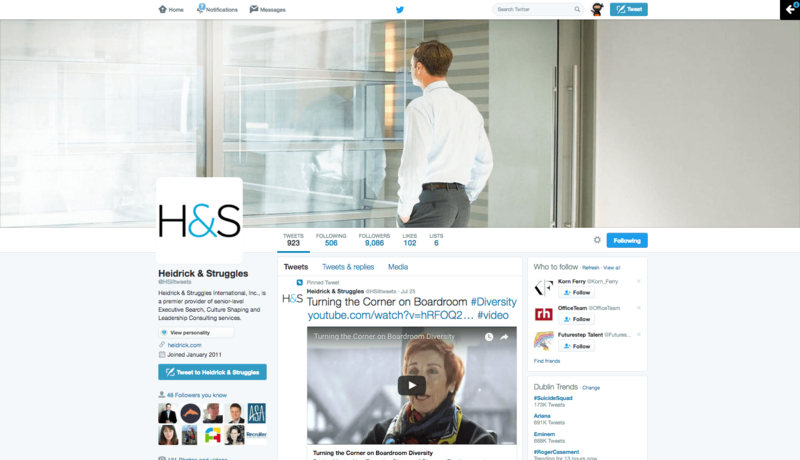 Executive Search firm, Heidrick & Struggles has Twitter down to a fine art. There’s a healthy focus on diversity in the organisation and this certainly shines through on their Twitter account. The organisation’s LeadershipTV video ‘Turning the Corner on Boardroom Diversity’ tells the story about how Patrice Merrin, Non-Executive Director of Glencore Plc became the first woman to be appointed to her company’s Board of Directors. Follow, watch and retweet immediately, if not sooner. Another Twitter account that’s not only aesthetically-pleasing but also incredibly useful in terms of the content that is pushed out to their almost 10,000 followers. 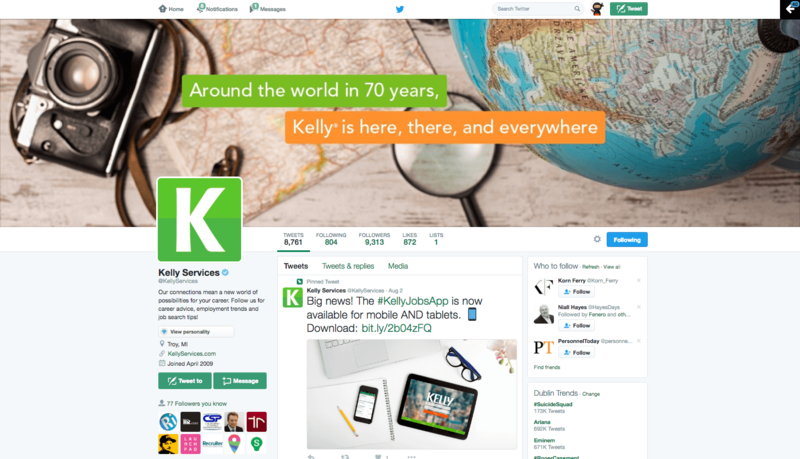 Blog posts, career and leadership tips are just some of the posts that the gang at Kelly Services post on their Twitter account every day. One thing that we are absolutely loving at the moment are the #70YearsOfKelly tweets, where the organisation takes a trip down memory lane to look at just how far they’ve come over the past 70 years. Well worth checking out! 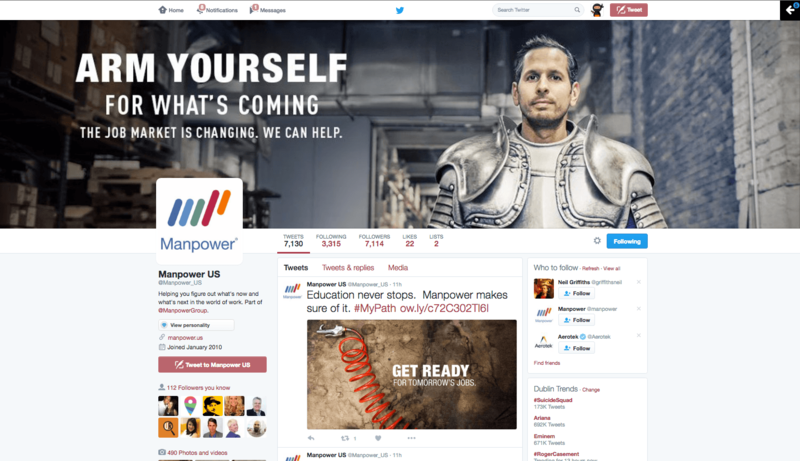 We’re massive fans of the #MyPath hashtag on the Manpower US Twitter account, which highlights their Careers Resources page, focusing on teaching associates how to arm themselves with the skills they need to enter the job market. The company mantra is that ‘The job market is changing. We can help’, and they certainly mean it. These guys are onto something and other recruiters should be taking copious notes as far as we’re concerned. 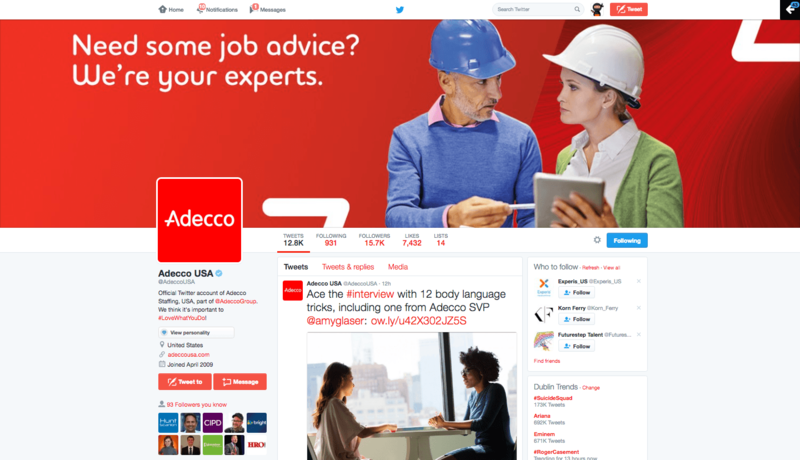 Adecco USA tweets about interview tips. And job openings. And annoying co-workers. And Star Trek. And the Olympics. Shall we go on? With nearly 16,000 followers Adecco’s Twitter game is strong. We’re also big fans of #LoveWhatYouDo, which gives followers an inside look at what it’s like to work at the organisation, and let us just tell you it seems like a hell of a lot of fun. Can we have some of those red sunglasses too, pretty please?! So what are your favourite USA recruitment Twitter accounts? Let us know if we’ve missed anyone on the list by commenting below or by tweeting us directly @SocialTalent! Whether your already using Twitter as part of your daily recruiting activities or trying it for the first time, these are 7 Twitter products you need in your arsenal. As of the end of September, professionals are signing up to join LinkedIn, the business-oriented social networking site, at an incredible rate - more than two new members per second. In recruitment news this week: there's more pay gap disparity, the REC warns ‘serious threats are looming’ over UK recruitment, the rise and rise of "employer shaming", Adecco's shock acquisition and the best Emninem-inspired cover letter you will ever read.